LOS ANGELES (AP) — The best NBA team in Los Angeles right now isn’t the one with LeBron James. Going into Wednesday, the Clippers were fourth in the rugged Western Conference at 8-5, with overtime wins against defending NBA champion Golden State and Milwaukee, as well as Oklahoma City and Houston (twice). While they don’t have talent on par with those teams, the Clippers are transitioning to a new era with a mix of veterans like Danilo Gallinari, Harris, Marcin Gortat and Patrick Beverley. Shai Gilgeous-Alexander has cracked the starting lineup as a rookie point guard. Montrezl Harrell brings a contagious energy off the bench. In a win over Washington, they had a franchise-record nine players score in double figures. With Hall of Famer Jerry West as a consultant, the Clippers added proven veteran support in Gortat, Mike Scott and 7-foot-3 Boban Marjanovic, a fan favorite. Lou Williams, last season’s Sixth Man of the Year, can score 20 points in a given night off the bench. 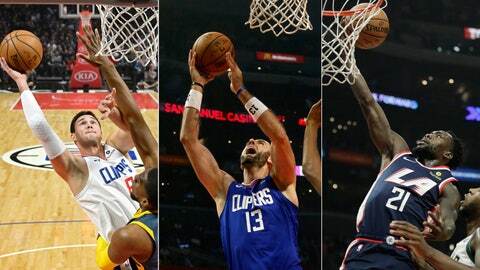 The names that led to the team’s Lob City nickname have moved on. DeAndre Jordan left for Dallas as a free agent last summer, Blake Griffin went to Detroit in a stunning February trade, and Chris Paul headed to Houston last year. With them went a lot of the drama that had surrounded the team in recent years. They’ve got it in Harrell, who ran up and jawed in Derrick Rose’s face during a win over Minnesota. Gilgeous-Alexander blocked a shot by Warriors All-Star Draymond Green and fearlessly drove at him in the paint. What they desperately need this season is good health. Injuries sidelined many of the veterans last season, notably Gallinari, Beverley and Avery Bradley, but the Clippers stayed in the playoff hunt until the final week of the season while relying on unproven players like Sindarius Thornwell and Tyrone Wallace. They just missed a playoff berth despite going 42-40 for their franchise-record seventh straight winning season. So far the injuries have been minor, with Bradley nursing a left ankle sprain and Luc Mbah a Moute out with a sore left knee. The team has bought into Rivers’ style of play, which is different than when Jordan, Griffin and Paul dominated the minutes. Not just now but next summer, too. That’s when the team will have significant spending power under the salary cap with enough money to try to lure two maximum-salaried players. They may look to add a star before the trade deadline using players like Harris, Gortat, Scott, Marjanovic and Mbah a Moute, who are all in the final years of their contracts, as trade bait. Until then, the Clippers will work to survive in the loaded West with a bunch of names you can’t tell without a roster sheet.